After years of development with many different directors attached, including M. Night Shyamalan and Alfonso Cuaron, LIFE OF PI has its first official trailer. Ang Lee came on in 2009 and filming has finally wrapped. Based on the book of the same name, PI follows a young man, Pi, as he survives a sinking of a freighter and finds himself on a lifeboat with a tiger. I will say that the trailer looks gorgeous. I'm not fully understanding what the full story is suppose to be. I'm getting a very CAST AWAY vibe with focusing on one man's journey of survival. Since I haven't read the book, I'll hold off until I see more. But now I really want a pet tiger. 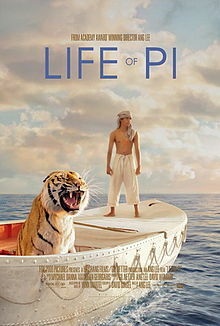 LIFE OF PI will be released November 21, 2012 starring Suraj Sharma, Gerard Depardieu, and Tobey Maguire.